Researchers from Cornell University and the University of Hawaii, as well as a nine-member volunteer crew, do hands-on training at Cornell University as part of a NASA study on space food. Researchers have selected six "gastronauts" who will put outer-space menus to the test next year during a four-month simulated Mars mission, conducted on a barren lava field in Hawaii. The mission, jointly sponsored by Cornell University and the University of Hawaii at Manoa, is known as HI-SEAS — which stands for Hawaii Space Exploration Analog and Simulation. It's part of a NASA study aimed at determining the best way to keep astronauts fed and in good spirits during a long-duration mission to a deep-space destination. "We tend to say it's Mars, but as long as it's long-term space exploration, this research should apply," Kim Binsted, an associate professor at the University of Hawaii's information and computer sciences department, told me today. The final six were chosen from nine finalists who spent several days in training last month at Cornell's test kitchens, where researchers develop all sorts of recipes for freeze-dried, canned, powdered or fresh-made foods suitable for spaceflight. Cornell has been doing these sorts of simulations for more than a decade — but the HI-SEAS mission is the most ambitious exercise yet. Oleg Abramov, a research space scientist at the U.S. Geological Survey's astrogeology branch in Flagstaff, Ariz.
Simon Engler, a programmer specializing in robotics who's currently on an internship at the Robotics Institute at Carnegie Mellon University. Kate Greene, a science and technology journalist, amateur filmmaker and open-water swimmer who is a native of Kansas and currently resides in San Francisco. Sian Proctor, a geology professor at South Mountain Community College in Phoenix. Yajaira Sierra-Sastre, a materials scientist and educator who is a resident in Ithaca, N.Y., and is currently working with disadvantaged school districts and communities in Puerto Rico. Angelo Vermeulen, a biologist, space researcher and visual artist from Belgium. Yvonne Cagle, a NASA astronaut and family physician who is currently on faculty and serves as the NASA liaison for exploration and space development with Singularity University in California. Crystal Spring Haney, a small-business owner, personal trainer and at-home mother of two from Kapolei in Hawaii. Chris Lowe, a space systems engineer from southeast England who currently resides in Glasgow, Scotland. Binsted told me it was hard to narrow down the prime crew to just six. "If we could stick nine people in the habitat, we would have," she said. 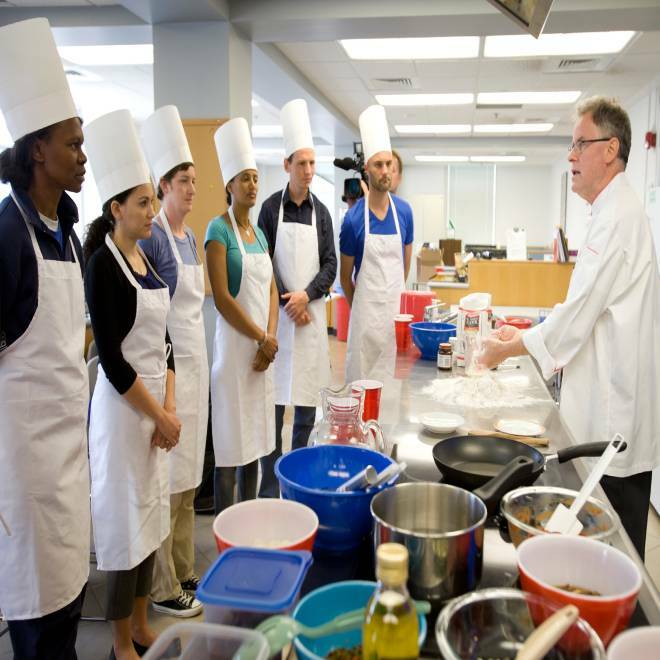 Cornell University chef Rupert Spies works with finalists for the HI-SEAS simulated space mission during a training session last month. In making the selection, the researchers wanted to strike a balance among the various skills that the crew members had to offer, and also come up with a team of "people you'd be happy to spend four months in a can with," Binsted said. The crew's cooking skills vary, she said: "There are a couple who cook quite a lot ... and a couple of people who don't cook at all." "We wanted to have people who were willing to eat anything they'd be asked to try," Binsted said. "Of course, if you try something and you don't like it, that's fine." The crew members will go through two weeks of additional training later this year, in preparation for the four-month exercise that begins next year in mid-March. They'll be paid $5,500 plus expenses for their time. In addition to trying out menus, the gastronauts will be pursuing their own projects in analog research or mission outreach. Binsted said the public will eventually be able to suggest recipes for the crew, or check out video updates on the mission blog. All communication with the team in their habitat will be delayed to simulate the light-speed travel time for signals between Earth and Mars. The crew will also be required to wear simulation spacesuits anytime they venture outside the habitat, as if they were really living on Mars instead of in Hawaii. Listen to interviews with candidates for the HI-SEAS space-food simulation. The point of all this is to see how the crew's diet affects their health and morale during the kind of isolation and day-to-day routine that a space crew experiences. One of the big challenges for a long-duration space mission is the potential for menu fatigue. Having the same thing over and over again is bad enough on Earth. When you're confined in a tin can for a space journey, it's even more of a drag. Past studies have shown that astronauts eventually get tired of eating the foods they normally enjoy, and tend to eat less. That could lead to nutritional deficiencies — thus adding to the health risks associated with life in low gravity. Binsted said the HI-SEAS crew will have a variety of menu items to try out: "A lot of freeze-dried fruits, vegetables and meats, textured vegetable protein, powdered eggs ... We'll have an international mix of ingredients, miso powder, dried tofu." During last month's session at Cornell, the finalists came up with their own menu items, including paella made with dried shrimp, coffee granita and a fruit smoothie using yogurt prepared from dried milk. The researchers want to measure the time, power and water requirements for instant foods vs. crew-cooked foods. They'll also test their hypothesis that the rituals associated with food can be a morale-booster during an interplanetary journey. After all, that's why they call it "comfort food." "It's hard to put a price tag on that," Jean Hunter, an associate professor of biological and environmental engineering at Cornell, said during last month's training session. The HI-SEAS mission is part of a three-year, $947,000 NASA study that also includes a head-down, bed-rest study at the NASA Flight Analogs Research Center in Galveston, Texas. In addition to Binsted and Hunter, the HI-SEAS research team includes Cornell's Bruce Halpern and Bryan Caldwell. Rupert Spies, chef and senior lecturer at Cornell's School of Hotel Administration, will assist in the development of the study's menu. You can follow @HI-SEAS on Twitter or on Facebook. Alan Boyle is msnbc.com's science editor. Connect with the Cosmic Log community by "liking" the log's Facebook page, following @b0yle on Twitter or following the Cosmic Log Google+ page. You can also check out "The Case for Pluto," my book about the controversial dwarf planet and the search for new worlds.